The revised NHSGGC Adult Infection Management Guidance is now available on staffnet in full and abbreviated poster versions. Laminates of the poster will be available from prescribing support teams soon. Upper UTI/Pyelonephritis in non-pregnant women and men – Trimethoprim 200mg bd now first line with co-amoxiclav 625mg or ciprofloxacin 500mg reserved for use if resistant organism suspected. Duration of treatment is now reduced to 7 days. Lower UTI in pregnancy – First line options are now nitrofurantoin 50mg or amoxicillin 500mg with trimethoprim 200mg 2nd line (off label) and cefalexin 500mg 3rd line. All 7 days. Acute Prostatitis – First line options now ciprofloxacin or trimethoprim for 28 days (and not nitrofurantoin). The GP Antibiotics App and E-formulary and synonyms for GP prescribing systems will be updated in due course. A protocol for the use of fosfomycin (unlicensed antibiotic for multi-resistant UTI as recommended by a microbiologist) is also now available. NHSGGC addictions services have recently advised of concern with service users reporting adverse effects and behaviours when they are using street ‘diazepam’. These diazepam come in a variety of blue tablets which contain anything from 8mg to 48mg per tablet. There has been awareness for some time of the increased risk of drug related harm and overdose for users when taking these types of tablets, often in large quantities, along with a variety of other depressants such as heroin, methadone and alcohol. The 2013 report on drug related deaths in Scotland showed that benzodiazepines were implicated in, or potentially contributed to, 149 deaths (28% of drug related deaths) and substances such as phenazepam and etizolam were implicated or present in a high proportion of drug related deaths. • There is no way of screening for illicit benzo use while prescribed benzos, only patient self report and clinical assessment of patient. • Chaotic/disinhibited behaviour, history of previous benzo use, ‘lost’ benzo prescriptions, low mood unresponsive to treatment etc may indicate illicit top up. • Consideration should be given to overdose risk if patient assessment suggests illicit use in addition to prescribed benzos and Z-hypnotics. • Review dose and instalment prescribing. • Counsel on risks of using illicit benzos on top of prescription and/or with other depressants. • Elicit pattern of use – is often weekly or fortnightly rather than daily dependant. • Counsel patient on risks of illicit benzo use and in particular overdose risk when used with other depressants. • Reassure patient they can safely reduce and stop illicit benzos whether dependant or sporadic use. • Patients can contact CAT team for signposting to recovery services or support with self reduction. • Exercise caution if considering prescribing as cannot quantify type or amount of benzo in street tablets and lack of evidence base to support prescribing. The message that these drugs should not be used with other depressants (including alcohol) should be made very clear to users. Background: Long-term antidepressant prescribing has increased (1), however the frequency of antidepressant reviews decreases with treatment duration (2), and the number of general practice consultations for depression has more than halved since 2003/04 (3). The aim of this GMS indicator was to enable and support the review of patients prescribed the same antidepressant for ≥2 years (excluding amitriptyline). Method: All patients prescribed antidepressants (excluding amitriptyline) were identified from records by the prescribing support team; August to October 2013. GPs selected a portion of patients, equivalent to 30 patients per 4000 registered patients, for face to face review of clinical condition and medications. 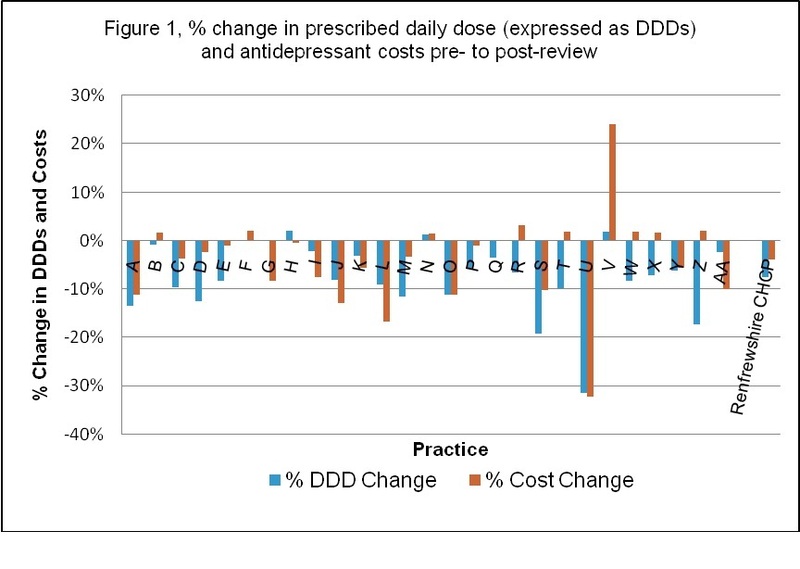 Pre- and post-review data were collected; average antidepressant doses and changes in prescribed daily doses (expressed as defined daily doses (DDDs)) were calculated. Onward referral to support services was recorded. Changes in patient care were compared to previous NHSGGC work in 4 CHCPs. Results: 28 practices participated in the initial identification work with 27 practices submitting data collection forms: 86% (25/29) of Renfrewshire practices and 2 non-Renfrewshire practices. 8.7% (13,398/153,658) of all registered patients were prescribed an antidepressant with 47.7% (6,390/13,398) prescribed the same antidepressant for ≥2 years. Practice antidepressant point prevalence varied significantly: median 8.9% (range 5.4% to 13.1%) for those prescribed an antidepressant with 48.5% (range 29.8% to 63.5%) of those prescribed the same antidepressant for ≥2 years. There was a significant positive correlation between the point prevalence and weighted DDDs/1000 patients (Pearson correlation 0.747, p<0.0001), and a weak non-significant correlation between long-term use and weighted DDDs/1000 patients (Pearson correlation 0.04 p=0.983). 27 practices reviewed and submitted data collection forms for 18.8% (1166/6197) of patients prescribed the same antidepressant for ≥2 years: 58 ± 14 years old with 72.6% being female. The main indications for antidepressant use were: 63.6% depression, 20.2% mixed depression anxiety and 11.0% anxiety disorders. 310 (26.6%) patients reviewed had a change in antidepressant therapy: 4.9% stopped, 11.1% reduced dose, 5.6% increased dose and 5.0% changed antidepressant altogether resulting in a 7.5% (95% CI = 7.2% to 7.9%, p=0.048) reduction in prescribed daily doses, expressed as DDDs, with an estimated 3.5% (£3240 per annum) reduction in prescribing costs (see figure 1) which is comparable to previous NHSGGC antidepressant review work (see table 1). 4.9% were referred onwards; two thirds to mental health services. Mean antidepressant doses were higher than previously reported in literature: fluoxetine 43% higher and sertraline 30% higher; however, citalopram doses were lower than previously observed in NHSGGC dropping by 17% to doses comparable with literature (4-6). Note: Previous long-term antidepressant review work with Inverclyde, North, North East and South West CHCPs was completed in 2009/10. †p-value and 95% CI calculated using two tailed t-test. †Renfrewshire patients only 2013/14. ‡Inverclyde reviewed patients twice within a 3 month period. Conclusion: Almost half of all people were prescribed the same antidepressants for ≥2 years. Appropriate reductions in prescribing can be achieved by reviewing patients with 1 in 4 (26.6%) receiving a change in antidepressant prescribing pre- to post-review. Higher antidepressant doses may be contributing to current antidepressant growth. Although, average citalopram doses were lower than observed in previous NHSGGC review work; possibly due to the MHRA warning regarding citalopram and QT prolongation (7). Generally the use of higher selective serotonin re-uptake inhibitor (SSRI) doses, >20mg fluoxetine/citalopram/paroxetine or >50mg sertraline daily, are of questionable value in treating depression; as SSRIs demonstrate a flat dose response for treatment of depression (8-10). Therefore higher doses do not routinely provide better effects, but are associated with more adverse effects (11-13). 1. Moore M, Yuen H, Dunn N, et al. Explaining the rise in antidepressant prescribing: A descriptive study using the general practice research database. BMJ 2009;339(7727):956. 2. Sinclair JE, Aucott LS, Lawton K, et al. The monitoring of long term prescriptions if antidepressants: observational study in a primary care setting. Fam Pract 2014 21/4/14;00(00):1-8. 3. Information Services Division Scotland. General practice depression consultations. Available at: http://www.isdscotland.org/Health-Topics/General-Practice/GP-Consultations/Health-Conditions/Depression/. (Accessed 2/9/14). 4. Poluzzi E, Motola D, Silvani C, et al.Prescriptions of antidepressants in primary care in Italy: pattern of use after admission of selective serotonin reuptake inhibitors for reimbursement. Eur J Clin Pharmacol 2004 Jan;59(11):825-831. 5. Donoghue JM, Tylee A. The treatment of depression: prescribing patterns of antidepressants in primary care in the UK. British Journal of Psychiatry 1996;168(2):164-168. 6. McManus P, Mant A, Mitchell P, et al. Use of antidepressants by general practitioners and psychiatrists in Australia. Aust NZ J Psych 2003;37(2):184-189. 7. Medicines and Healthcare products Regulatory Agency. Citalopram and escitalopram: QT interval prolongation—new maximum daily dose restrictions (including in elderly patients), contraindications, and warnings, 2011; Available at: http://www.mhra.gov.uk/Safetyinformation/DrugSafetyUpdate/CON137769. (Accessed 5/6/14). 8. NICE 90, Clinical Guideline 2009. Depression: the treatment and management of depression in adults. 9. Anderson IM, Ferrier IN, Baldwin RC, et al. Evidence-based guidelines for treating depressive disorders with antidepressants: a revision of the 2000 British Association for Psychopharmacology guidelines. J Psychopharmacology 2008;22(4):343-396. 10. The Maudsley Prescribing Guidelines 11th Ed Wiley-Blackwell 2012. 11. Adli M, Baethge C, Heinz A, et al. Is dose escalation of antidepressants a rational strategy after a medium-dose treatment has failed? A systematic review. Euro Arch Psych & Clinical Neuroscience 2005;255(6):387-400. 12. Sterke CS, Ziere G, van Beeck EF, et al. Dose-response relationship between selective serotonin re-uptake inhibitors and injurious falls: a study in nursing home residents with dementia. Br J Clin Pharmacol 2012;73(5):812-820. The Department of Health have recently removed the restrictions on the use of sildenafil (ie those required for the selected list scheme (SLS)). The regulations for Scotland have not yet been amended but we will advise in a future bulletin when this occurs. We do not have any information as to when this will happen at this stage. Prescribers in Scotland should continue to observe the SLS requirements in the interim.